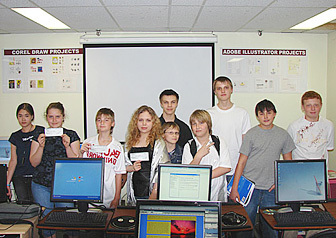 In 1999, Teens Computer School opens its doors for school age students as a department of New Image College of design andTechnology. It is a unique program, one of a kind in North America, designed for future digital superstars. Thanks to professionally prepared portfolios at Teens Computer School, many of its graduates have entered colleges and universities. Teens Computer School students are more respected by their teachers and friends, as they are savvy in doing more complex and mature things such as animation, web design and graphic design. Statistics says that children, who choose their area of interests at the school age, study better in the university and colleges and become outstanding professionals. They have higher standard of living and get more satisfaction in life. Today Teens Computer School has branches in Toronto, Chicago, New York, Edmonton and Prague. Thanks to on-line training the classes are available for everyone and everywhere! Our program will prepare students for lifelong opportunities and will help them to become leaders in the field of digital design. Teens Computer School constantly adding new technologies, so that our students get a current and relevant educational experience in applied computer technologies. The opportunities in this industry seem to grow every day. Digital design related jobs are one of the top eight professions that will experience growth over the next ten years with an estimated 20% of annual growth. Graduates of our school has no problem with the question of “Where to go after High school?” They are fully prepared with a professional to any career. Our school this is their key to many colleges and Universities in North America. We are proud to raise new computer SUPERSTARS!